LEON GREENING is a brilliant pianist and listening to him is like hearing the history of Post Bop Piano. With him this evening will be MATT WATES who is said to be the most swinging Alto player on both sides of the Atlantic. On Double Bass we will have MALCOLM CREESE and on Drums none other than BOBBY WORTH. On November 20 2016 - DEELEE DUBE was one of only 5 Finalists (out of 153) to be selected to take part in the Finals of the Sarah Vaughan International Competition in the US. SHE HAS WON THE CONTEST !!! - SO - as we said before..... THIS LADY CAN SING !!! Come along to BEXLEY JAZZ CLUB this evening and judge for yourself. Since January 2015, Deelee has been resident singer at Renato D’Aiello’s Late, Late Show at Ronnie Scott's. also teaming up with the Renato D’Aiello Sextet, and performing to a full house at Pizza Express Jazz Club, Dean Sreet for two nights in February 2015. Born in London, Deelee studied at the Brit School of performing Arts and pursued an academic path in music - graduating with a BA honours degree. Deelee possesses a voice quality that is wonderfully versatile, ranging from a sonorous vibrant tone to a stunningly mature and sophisticated one, yet all encapsulated within a wide vocal range that remains pure across her entire vocal register. Deelee especially captures the attention of audiences with her swooping glissandi and variation of melody, and, most notably, her unique expression of emotion and intonation through song. SCOTT HAMILTON is in demand the world over - so BOOK TODAY for your place at BEXLEY, 16-01-2017. FIRST OF ALL - DO PLEASE NOTE OUR NEW START TIME AT BEXLEY OF 8PM - FINISHING 10.30PM. It is always a delight to welcome AL NICHOLLS back to Bexley - both as a person and musician. Through the bands of Ray Gelato, The Big Town Playboys, Kings Pleasure etc Al comes to us now as Leader and musical driving force of London's jump jive and swing band - Blue Harlem. YOU'VE GOT TO DIG IT TO DIG - YOU DIG ! Who else - but "Son of Bexley" - MR DEREK NASH. Front Lining together with Derek this evening will be ENRICO TOMASSO - Trumpet & Vocals. Enrico simply loves, stylistically, to play across the board - Swing, Mainstream, Bop - keeping his music forever fresh - with echoes from the Ken Mackintosh Band, Pasadena Orchestra, Ray Gelato, Acker Bilk, Harry Gold etc etc. He's back with us once more - the irrepressible - the superb MR ALAN BARNES together with great pianist and longtime friend of Alan's - MR BRIAN DEE. On Bass will be MR. SIMON THORPE and on drums MR DAVE BARRY. Alan promises a "Christmassey" evening - so do come and join us to get into that "25th Mood". DAMON BROWN is a superb musician with a unique voice on both Trumpet & Flugelhorn - presenting this evening his KOREAN TRIO. KANG WOONG and PARK JIN KYO lived and studied together for 3 years in New York with two of the jazz greats on their instruments - Peter Berstein and Ron Carter. Hence, when they returned to Seoul they quickly became two of the busiest rythm section men on the scene. This Tour with Damon celebrates the release of their new CD "WALKING ON". Of the great Tenorist - HARRY ALLEN - Gene Lees writes, "Stan Getz was once asked his idea of the perfect tenor saxophone soloist. His answer was, 'My technique, Al Cohn's ideas, and Zoot's time.' The fulfillment of that ideal may well be embodied in thirty-year-old HARRY ALLEN." 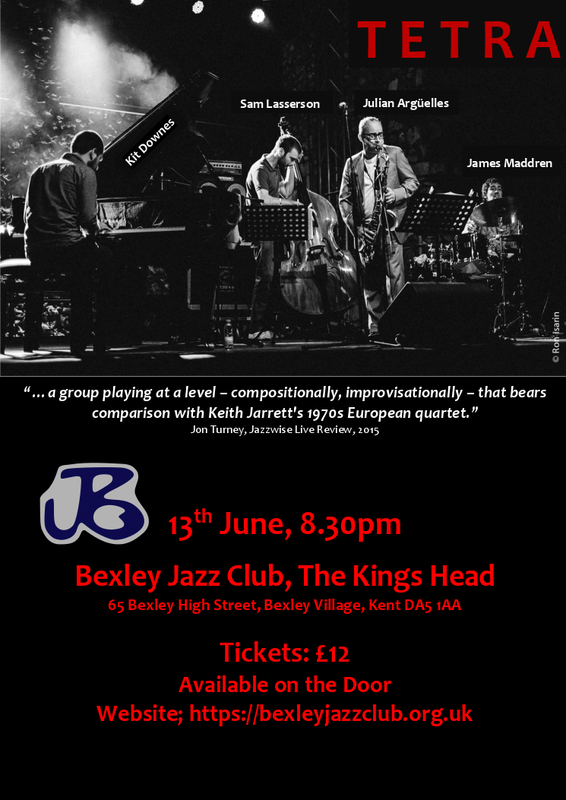 Likewise John Pizzarelli says "Harry Allen's playing is nothing less than PERFECT"
So we seem assured of another truly great evening of jazz here at Bexley. Harry Allen's backing will, of course, be the best - with ANDREA POZZA/keys - SIMON WOOLF/bass and STEVE BROWN on drums. This evening will be very special - presented by CHRIS HARE who instigated and directed the Lewisham Jazz Festival throughout the 80s - sponsored by Citibank - with an 800 seater theatre staging such as Buddy Rich, George Shearing, Peggy Lee, Wynton Marsalis, Sarah Vaughan, Roberta Flack etc. The Festival won 4 major Awards and was broadcast around the world. This evening Chris will present vocalist VERONA CHARD - together with his unique memories and anecdotes gathered throughout his 40 years in jazz and entertainment. VERONA met Humphrey Lyttleton in 2005 through jazz pianist Ted Beament - when Humph asked Verona to feature on the "Jail Break" track for his "Sad Sweet Songs & Crazy Rhythms" album. JULIAN MARC STRINGLE is back with us once more - Clarinet, Saxophone and Vocals - along with the great guitarist - DOMINIC ASHWORTH - PAUL MORGAN on double bass and BOBBY WORTH on drums. Aydenne is one of London's finest Jazz singers - as many testimonials will tell you. For 26 years Aydenne has wowed audiences with her deep, powerful vocal tones - taking her career to countless prestigious milestone performances. For Aydenne 2016 has been a great year - having released two singles in early 2016, showcasing her song writing ability! Look out for them on sale this evening. YOU'VE GOT TO DIG IT TO DIG - YOU DIG ! Who else - but "Son of Bexley" - DEREK NASH. PAUL HIGGS presents "A Brief History of Jazz"
In this Show Paul presents a musical tour of the history of jazz, playing hits by the legendary greats - Bix Beiderbecke, Louis Armstrong, Dizzy Gillespie, Chet Baker and Miles Davis - amongst others. He takes you from the early styles of New Orleans, Swing and Bebop, through to cool jazz, modal and latin. Paul has performed with Johnny Dankworth, Lulu, Tony Hatch, John Williams, Peggy Lee and Nancy Wilson. He has also performed in many concert venues around the world, including our own Ronnie Scott's, Royal Albert Hall's Elgar Room and regularly receives a standing ovation. His understanding of musical genres and composition, coupled with his exceptional skills as a performer ensure that he is very much in demand. We're delighted to welcome BRANDON ALLEN back to BEXLEY again. Orginally from Perth, Western Australia, Brandon has now been based in London for the past 16 years - since when he has worked with many and varied artists, groups and ensembles. SEBASTIAAN DE KROM has been a winner of the prestigious Buddy Rich Award. GREG ABATE is a man who has built a career as a powerhouse reed man and a proponent of the mainstream bebop style - earning the nickname "The Prince of Bop". He is a multi instrumentalist - equally at home on alto, tenor, soprano, baritone, flute.....think Charlie Parker, Phil Woods. When our very own - and so sadly missed - Joe Mudele first heard him he turned to me and said "What a sound" - quite a compliment coming from Joe. ............should be a lot of fun - come and join us ! PHILIP ACHILLE makes his first appearance at Bexley this evening - a superb musician presenting jazz with the Chromatic Harmonica - another 'first' for Bexley. Philip has been classically trained, from a very young age, by one of the great masters - James Hughes. Although a dedicated jazz musician, Philip has also played to a packed Royal Albert Hall - and plays double bass. JULIAN ARGUELLES QRT with "TETRA"
"one is left almost speechless" The Independent. ......simply great music from a Great Band. ALAN BARNES plays music that was radical 50 years ago - hard urban post bop - but he infuses it with so much passion and energy you could believe it was minted on the spot - which is always part of the story of jazz (John Walters, The Guardian). Alan is a multi, multi Award Winning Saxophonist - and, as always, we're simply delighted to welcome at Bexley. With DAVE GREEN and CLARKE TRACEY - we're assured of yet another great evening of Jazz.